The symbol of HSP is the Sphere. A polymer, pigment, nanoparticle etc. can be defined by seeing in which solvents it is soluble or insoluble (or swollen/unswollen, dispersed/undispersed...) then generating a sphere with all the good solvents inside it and all the bad solvents outside. This works well for a very large number of cases. But it is easy to imagine cases where this must not work. A pure di-block copolymer would behave as two separate polymers in the case of such a solvent test. It is possible that one giant sphere could cover all the good solvents, but this would be relatively meaningless. Instead, the data would be best fit to a double sphere. That is an extreme. But there are plenty of cases where there will be an X-domain and a Y-domain in a polymer. Take, for example, the popular silicone acrylates. These are designed to span the worlds of classical acrylates and classical silicones, so it is likely (and has been found experimentally) that the data are better fit by a double sphere. Two datasets, courtesy of Dr Yamamoto at his Pirika site show this in practice. The solubility behaviour of steric acid might be expected to show a "hydrocarbon" domain and an "acid" domain. Some experimental data seem to confirm this. Although the data can be fitted to a single sphere, they seem more natural as a double sphere. The sphere in the more polar and hydrogen bonding part of the HSP space corresponds to the acid part of the molecule and the non-polar sphere corresponds more to the tail. Such effects are even more extreme when surfactants are tested, and for these molecules a double sphere is about the only sensible way to fit the data. As we know, fluoropolymers can show interesting behaviour. In one way they can show the extremely non-polar fluoro effect, but something like -CH2-CF2- shows strong polarisation. So are fluoropolymers polar or non-polar? 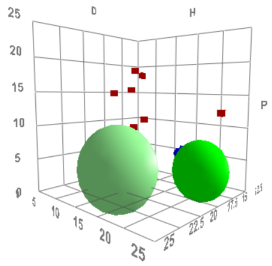 In this example the swelling data of Viton, a copolymer of vinylidene fluoride and hexafluoropropene, is probably best explained as having two types of behaviour - non-polar and polar as shown by the double sphere fit. Some caution is required. It is hard to identify an objective criterion for an optimal double sphere fit so such fits must be used in conjunction with chemical knowledge before deciding on the two sphere HSP values and radii. A real puzzle for all of us is PDMS, polydimethylsiloxane. We know that short-chain polysiloxanes are highly hydrophobic, low dispersion energy molecules, with HSP values like [12, 0, 0]; very low δD and zero polar and hydrogen bonding. Yet the long-chain version is soluble (or swellable) in THF, chloroform as well as in, say, pentane. What is going on? 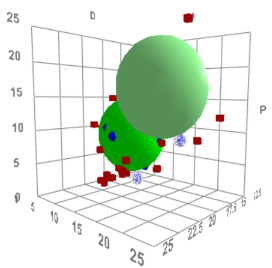 It is possible to perform a classic Sphere fit on PDMS swelling data (e.g. a paper from Prof Whitesides at Harvard has a good set of such data) and this puts PDMS in the [17, 2, 4] range - far away from where we know short oligo-siloxanes to be. One idea is to try a double sphere fit. Here we see a sphere down in the [14, 1, 1], closer to what we would expect from a siloxane, and another in [17, 4, 4] which is quite a "normal" polymer range. The real distinction of PDMS is the very low resistance to rotation around the Si-O-Si bonds, so PDMS can readily rotate to suit its environment. It can present a wall of pure -CH3 groups to give its classic low surface energy side, but it can equally present its Si-O-Si face to a solvent, which is more polar and higher δD. Although the double sphere does not prove this, it at least provides strong support for this model.